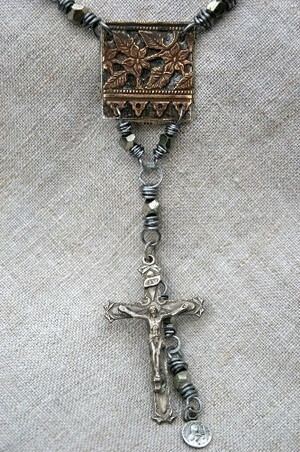 For a long time now, I've been inspired to use vintage rosary parts in my jewelry pieces. Some of the crosses, crucifixes and medals I've come across are worn smooth; the details rubbed away by the original owner's loving fingers. Many a prayer has been said over some of these elements! 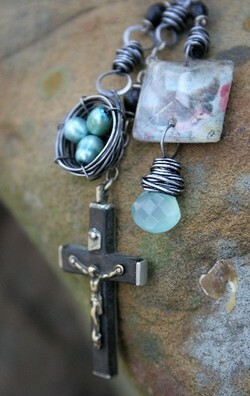 So, what's so inspiring about rosaries? 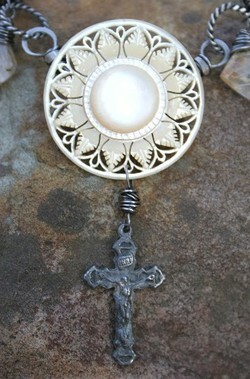 They contain one of my favorite symbols, the cross/crucifix and also, one of my favorite jewelry making materials, beads. What a great combination! But, it's not just the elements, it's the meaning and symbolism they carry. 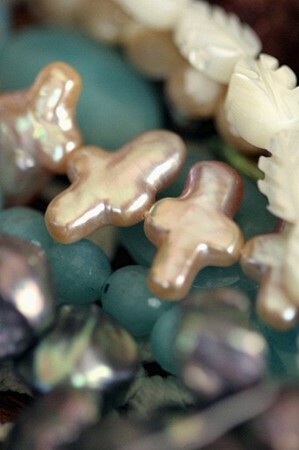 Rosaries and prayer beads have long been used as method for counting prayers. 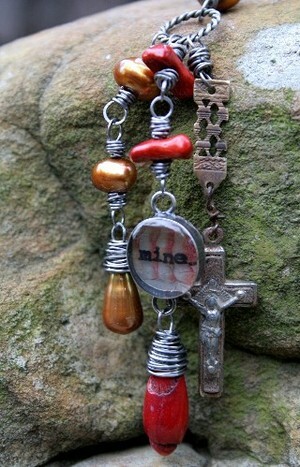 Rosaries, in particular, are used as a help in reciting verbal prayer and for meditation on the mysteries of Christ. These mysteries are divided into the "joyful", "luminous", "sorrowful" and "glorious" mysteries and reflect various aspects of the life, death and resurrection of Christ. What is more important, to me, about the rosary is the idea behind it: a daily discipline of prayer. Not necessarily specific, repeated prayers but the intentional, daily devotion to prayer. Prayer is our connection to God. Without it, our spiritual lives suffer greatly. This is my latest work in a long string of rosary inspired pieces. 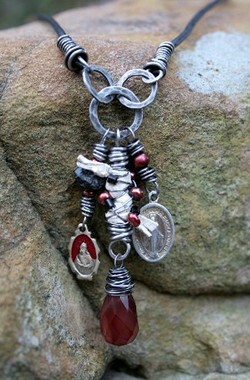 For the chain, I used gorgeous, fat, faceted onyx beads, and pyrite chunks , all rosary wrapped (of course!). 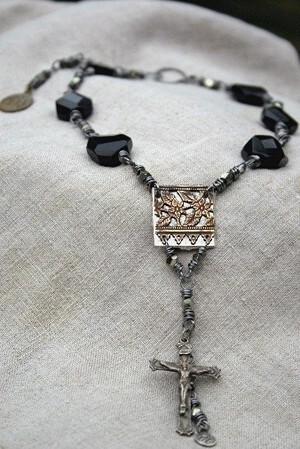 The word "rosary" originates from the Latin for "rose garden". For the focal of this piece, I used a piece of antique, filigree brass with a flower design...a reference to the rose garden. 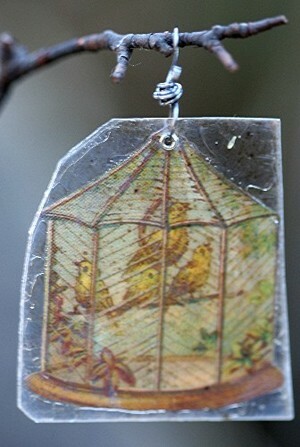 Sandwiched between this and two pieces of mica are pieces of pages from an antique, German Bible. 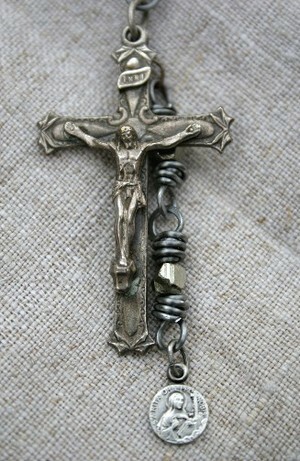 And, of course, the star of this show is an antique crucifix with a vintage holy medal, wrapped with more pyrite. 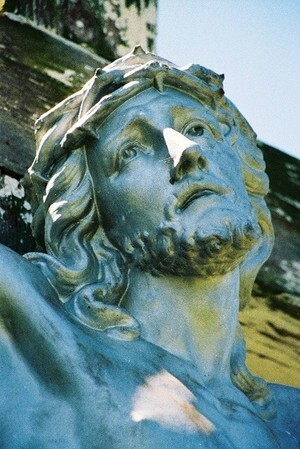 This is an especially lovely crucifix, don't you think? I know I've said it before but, I must say it again...I really do appreciate those of you who take time out of your day to pop in and see what's happening here on my blog. I know you're taking time and attention away from your desks, studios and loved ones just to check up on me and maybe even leave a comment. I really am blessed with quite a few lovely, dedicated readers. And, oh, so generous! I received a wonderful surprise in the mail today. 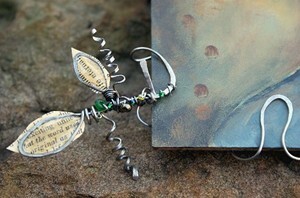 Just look at this delightful, soldered flower pendant given to me by my faithful reader Cindy Dean. 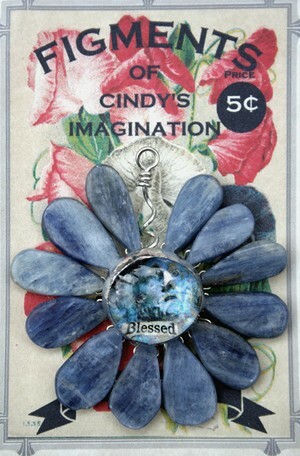 Cindy's flowers are just adorable and such a clever design. 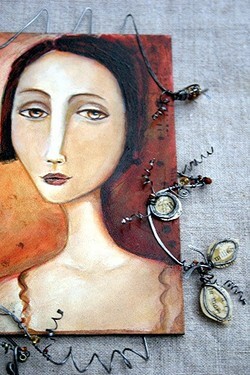 You can see more at her etsy shop. I'm thrilled that she customized this one for me. 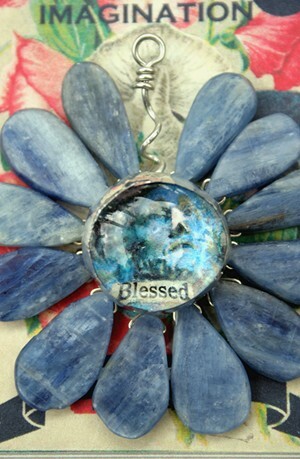 Not only did she use one of my favorite stones, kyanite, but she used one of my own cemetery photos for the flower's center. Isn't that the coolest?! There you have it...my plan for the perfect blog. I've tagged only five but there are tons of talented bloggers out there. What are your best blogging tips? Between working on class samples and other projects, I got to play around with some of the new beads I picked up at the gem show. 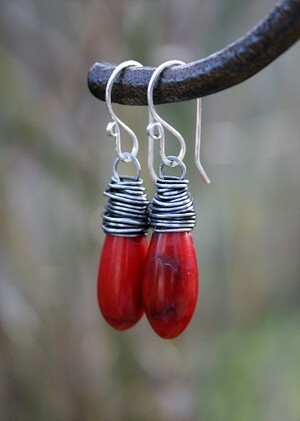 When I ran these coral drops through my fingers, I knew what I was going to do with them. I love their weight and smooth texture. 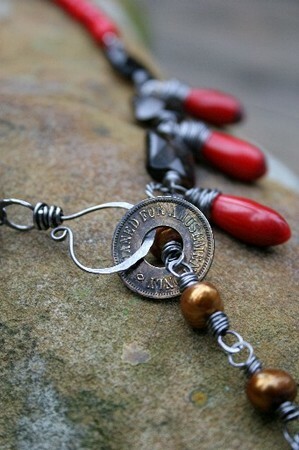 My vision for these was to incorporate them into a lariat style necklace ending in a "tassel". 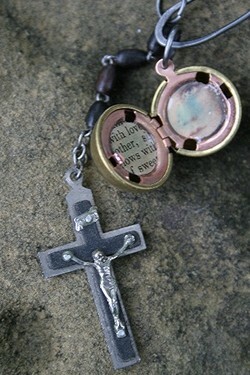 The tassel includes a vintage Lourdes crucifix and a resin filled bezel. 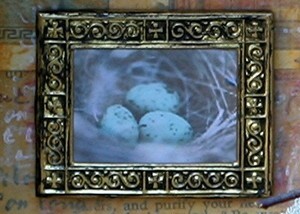 Inside the bezel is an image of toes with the word "mine" layered over top. 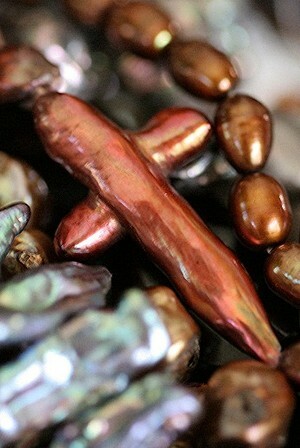 I worked in freshwater pearls in a beautiful, glowing gold and some faceted smoky quartz. 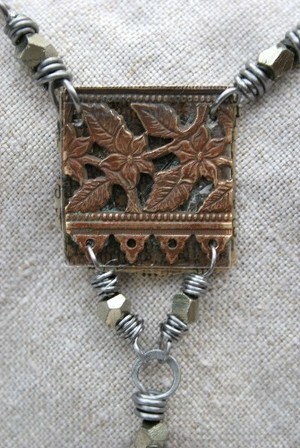 I used a vintage game token for part of the clasp. 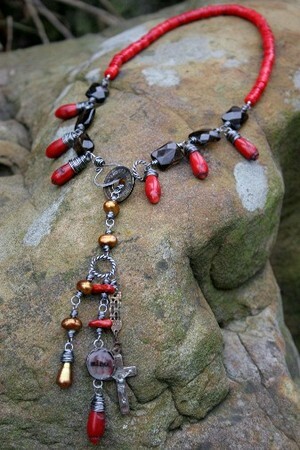 I love the color combination in this piece, especially the red with Valentine's day coming up. I did earrings to match which are available at my Etsy shop. 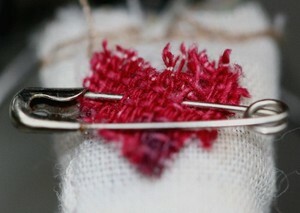 ...wear your heart on your sleeve? 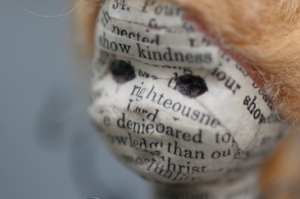 ...show kindness?...see others as they are?...see yourself as you are? Agree with each other, love each other, be deep-spirited friends. 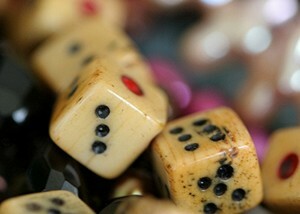 Don't push your way to the front; don't sweet-talk your way to the top. Put yourself aside, and help others get ahead. Don't be obsessed with getting your own advantage. Forget yourselves long enough to lend a helping hand. Forget yourself. How many days do I forget to forget myself? How many times a day do I forget to forget myself?! "He cut me off in traffic!" "She insulted me!" "I should have been first in line!" The other day, I infuriated a man who wanted me to yield so he could pull into traffic. It was my right-of-way but, traffic was fairly heavy and I could have let him in...if I'd seen him. I didn't see him until it was too late and then, what I saw was one mad fella. Gesticulating, grimacing and mouthing something...I don't want to know what! My immediate reaction was to be angry right back. After all, what right does this guy have to cuss me out? Maybe none. But, on second thought, what harm was really done? Does it help me, this man, society, the universe...for two to be angry now instead of one? Hey, maybe this poor, upset man was having a hard day. Maybe his coffee was cold. Maybe his pick-up broke down and he had to drive that sad, little economy car instead. Maybe his child was in trouble. Or, maybe he got some really bad news that morning. Who am I to put my emotions and reactions first anyway? What?? You mean it's not all about me? As teacher Beth Moore says "Am I speakin' to anybody out there?" The special occasion is past. 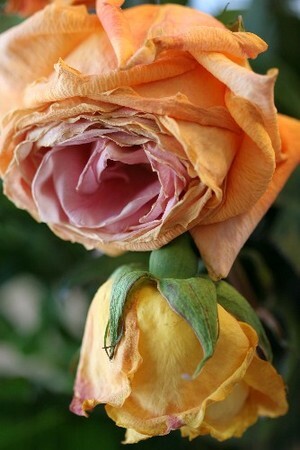 They're just as beautiful faded as fresh. More beautiful, actually, with more character, more lovely, muted tones and more interesting shapes. Does beauty have to be "fresh" to be beautiful? Something shiny that glows when the light hits it. 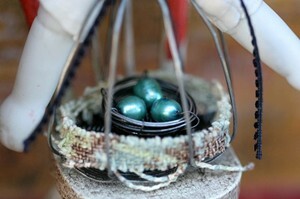 Something from the sea...something colored robin's egg blue. Something made from ox bone...ancient bartering tools. Something in the shape of a cross. 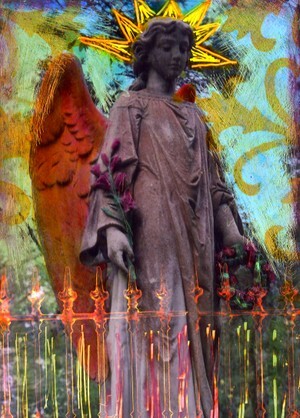 Something old and crackled...something rough and textured...something sublime. I traipsed across town to the International Gem and Jewelry Show yesterday, braving the traffic, wind and low temperature (It only got up to 53 degrees here yesterday. Compared to a record high of 81 degrees in the year 2000...that's downright chilly!). It was well worth the trip to come back with some unique treasure. 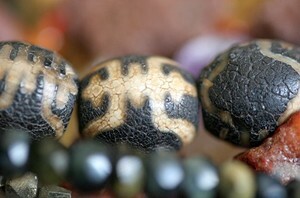 If anyone can tell me what the crackled beads pictured above are made of, I'd love to hear! The bead dealer knew they came from Ethiopia but she couldn't tell me what they were made of. Aren't they great? Isn't she beautiful?! 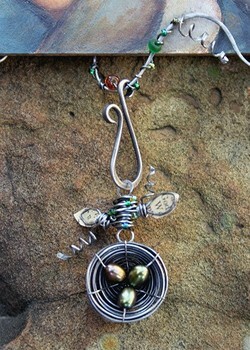 I've just finished the wirework on another sample for the collaborative workshop DJ Pettitt and I will teach this June at The Paper Studio in Tempe, Arizona. 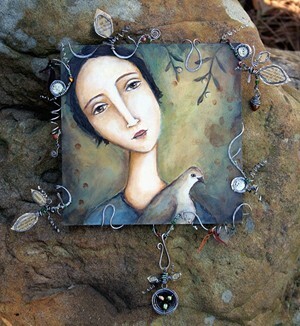 ...and of course she's collected a precious bird's nest in her travels (detachable to be worn as a necklace). There's been a lot of interest in this workshop and registration hasn't begun yet but keep watching here, on the Paper Studio site or on DJ's blog for more info. I promise, you'll be the first to know! The first day of the workshop, DJ will be teaching students her step-by-step techniques for painting a one-of-a-kind, beautiful ladies and backgrounds with interest and depth. 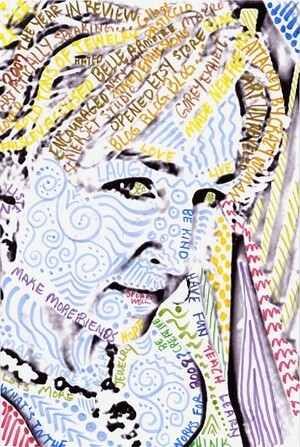 In case you're not familiar with DJ, she is an extremely talented artist and generous teacher. 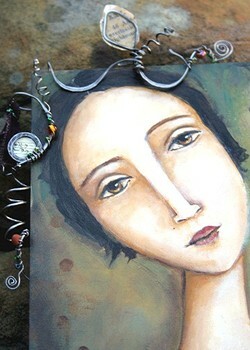 Her original painting style and fresh ideas have kept her on the cutting edge of our mixed media/art world. In person, DJ's paintings are absolutely stunning. The colors are gorgeous, rich and deep. 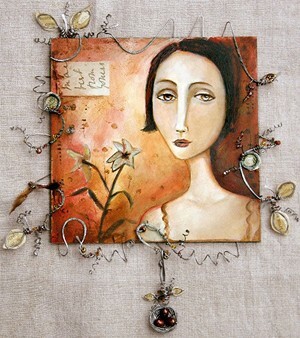 The second day of the workshop, I'll be teaching wireworking techniques that will enable students to frame their paintings in a unique and artistic way. These ladies are going to take a walk in the woods! 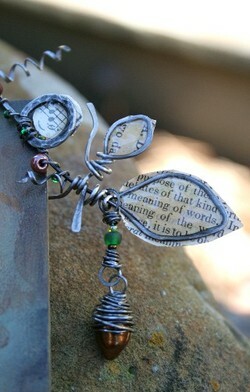 The techniques I'm teaching can also be used in jewelry making, book making, and many other mediums. But, this isn't just a frame...no, no! 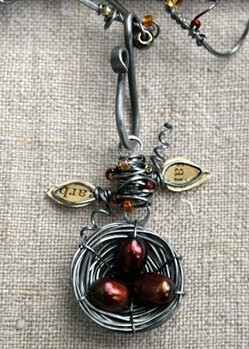 The adorable, whimsical, wire nest charm, with it's tiny leaves and tendrils, detaches from it's hook and can be worn as a necklace. Jen Worden is posting weekly art challenges to her blog and, it looked like so much fun, I decided to take her up on challenge #1. Granted...I'm late but, it's all part of my new year's "plan". This year I will dance to my own drummer...set my own pace...do my own thing. Well, at least for this week's challenge! So, here is my self-portrait/year-in-review/new year's resolution post card.